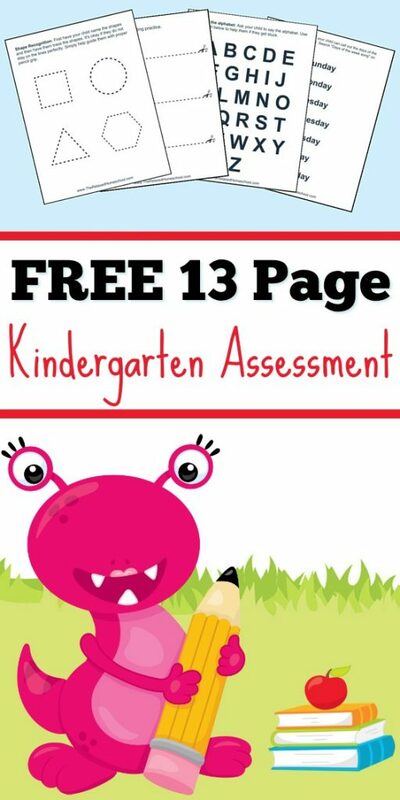 Kindergarten Assessment it's FREE! 13 pages to test Kindergarten readiness! You are here: Home / FREE Printables / FREE Kindergarten Assessment! Do you have a little one who will be starting Kindergarten soon? Are you worried about their Kindergarten readiness? Wonder where they stand on their basic skills? If so it’s time for a Kindergarten Assessment! This post contains some affiliate links for your convenience. This means I may receive a small commission if you purchase anything through these links. Click here to read my full disclosure policy. This is a great way for you to help find any learning gaps early on so that you can address those right away! You can repeat this assessment again later to watch your child’s progress. ** All files are now delivered directly to your inbox. This will also add you to our newsletter if you are not already signed up with us. Don’t worry, you will not get added to our list more than once. This format helps our site to run more smoothly and load quickly for our readers. ENJOY! I would like to download the Kindergarten Assesment but can’t figure out how to get it. I’ve subscribed and do not get a link sent to me or can I find a way to log in so I can download. Can you please help? I did the same as the other people and cant get the printables . When I verified my e-mail it tried to take me to homegrownlove101.com which is not correct, so I can’t access this. I really really want this for my girls. Please let me know if there is another way to get it, or you can e-mail it to me. Thanks! hello there! thanks a lot for the freebies here on your page, it’s really helpful. But just like the rest i’m also having a hard time getting the link for the download. i’ve already subscribed and is still waiting for the link. would appreciate more if you could help me with this. Thanks a lot. Hi there, I submitted my email address and confirmed it but every page of yours that I click on says to subscribe to our newsletter and it’ll be in our newsletter. In the first email I got there is a link to freebies it says, but the link is invalid. Thanks I will recheck the link. I will have the planner link in every Thursday’s email so keep an eye out for that. I signed up and was able to download immediately on my first attempt. Thank you so much! These freebies are wonderful! Hi there, I am having trouble downloading the assessment pack…I have signed up and received my welcome email but no password as stated in your trouble shooting…there is no where for me to put a password in or download anything??? I signed up but I am receiving nothing through the email. I would love to download these amazing worksheets but can’t seem to do it. My 8-year-old will still play with it! LOL!